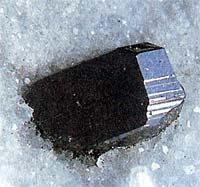 Usually dense or grainy, often presented the crystals of prismatic type, characteristic black-gray color, sometimes with iridescent superficial tape. Chemical composition (chemistry, compound). Copper (Su) 48,4%, arsenic (As) 19,0%, Sulphur, Sulfur, Brimstone (S) 32,6%. Form of crystals. Stolbchatye, on verges vertical shading, rarer plate tablet lamellar. Crystalline structure. Analogical the structure of wurtzite. Class of symmetry. Rhombo-piramidal-mm2. Cleavage. Perfect to on (110). Aggregates. Dense the masses, spar-like aggregates or dispersion, dissemination. Added the action of aquafortis; flakes are thus selected grey. At heating publishes the characteristic smell of garlic. On coal melt fuse with formation of white jack of oxide of trivalent arsenic. A mineral is not too widespread. Be found in primary deposits in an association with bornite, Pyrite, sphalerite, quartz, barytes and other minerals. Together with a Pyrite, bornite, tennantite, Luconite be found in deposits: Rechk (Hungary, EU), Brikslegg in austrian Tyrol, coniferous Forest in Serbia, as continuous the masses and unusual crystals to Byutt (the state is Montana, USA). Wonderful crystals are found in Serro-de-Pasko and Kirivilka in Peru, Chikikamata in Chile, Serra-de-famatina in Argentina, Chilung (Taiwan). In Italy found out good crystals (to 1-2 sm) together with a Pyrite and covellite in Ka-Labone (Sardinia). Very little crystals are met in the neglected mine of Torrebel'vichino, a province Vichenca. Used for the receipt preparation of copper and arsenic.